This was a great month. The six videos produced are all killer, no filler, and it features two of my favorite vids ever, one of which was super successful, and one of which annoyingly continues to fail to find an audience. I also like the range of this month’s vids, from Abortion to TV shows about Vikings. When I started this channel I promised myself I would never touch two topics: Abortion and Israel. My thinking was that bringing them up was a no-win proposition, guaranteed to lose me half my audience. I started off this month by violating this resolution and covering Abortion with “Purvi Patel and the Truth About Abortion Politics“. I think there’s a fair amount here that both Pro-Life and Pro-Choice people can agree on. It was also fun shooting this with some members of my Improv group The Clap. I’ve actually shot a video on Israel as well, though I doubt that will ever see the light of day. It may seem silly today, but 13 months ago Jeb Bush really looked like the most likely Republican nominee for President. This prompted me to make April’s second video “Why Jeb Bush Should Not Be President” as a counterpart to my perennially popular “Why Hillary Clinton Should Not Be US President“. Looking at the Jeb video now, I’m kind of amazed at the amount of stuff I have managed to pack into it. In just over three minutes it’s got a pocket history of the Bush family, and the Medici family as well as the rise and fall of the Florentine Republic. Not sure if this style is the best for viewers, but I certainly enjoy it. Makes me think my recent videos have gotten unnecessarily bloated. Next up is one of my aforementioned favorites, “How Wall Street Killed the State of New York“. It’s well researched, has great visuals, a strong and innovative argument, a good title, a picture of my high school car … and took over a year to pass 200 views. Annoying. Next up was “Vikings and the Rebirth of the History Channel” which may reveal a bit too much about my misspent college years. “3 Reasons China Will Never Rule the World” is another one of my favorites, and one that has happily been super successful as well. It was my fourth video to pass 10,000 views. Fun note about this one, I think it may have experienced the attentions of the Chinese government’s legendary social media army. Throughout its period of fastest viewership, the like and dislike tallies were kept suspiciously close together. The month closed out with “Who Really Runs The United States” which does a bit of presidential history, and points out how the old regional power bases that used to trade the office back and forth are now being replaced by a single massive oligarchy generated in ivy league schools. April was another good month, though viewership fell from 20,410 in March to 17,963. The bulk of views was once again January 2015’s John Oliver video, but it had fallen of from last month by about 5K. Compensating to some extent was Hillary Clinton’s announcement of her candidacy for president on April 12th, 2015. The “Why Hillary Clinton Should Not Be US President” video had been ticking over slowly since it was produced in July 2014, averaging 100-150 views a month. On April 12th, it got 366 views, and the monthly view count hasn’t fallen below 1,000 since. Here’s a graph. April 2015 is pretty clear. A year later the view count just keeps rising, which I hope it will continue to do through November. Only one of the month’s top five videos was produced in April. Four of the 6 videos produced broke 100 views on the first day (OK the China vid was only 99), and 13 months later all of them have broken 200 views, and 5 of 6 have broken 400. At the end of April 2015 we had 91 videos, all of which were viewed at least twice in April, 76 of which were viewed more than 10 times, 13 of which were viewed more than 100 times, and four(!) of which were viewed more than 1000 times ( FATCA, John Oliver, Hillary Clinton, and Kim Kanye ). At the end of last month I was once again contemplating the prospect of ever advancing view counts and sure success! That’s not what I got in April 2015. It demonstrates the power of a single video. It didn’t matter that April was a bigger month than March on almost every other metric. The biggest vid fell by 5K so that was that. Nertz. The big news this month was the John Oliver video I had produced the month before. In under a month, it zoomed up to become my second most watched video ever, doubling monthly views for the channel and driving them over 10,000 for only the third time in the year since I started. fifteen months later, monthly views still haven’t fallen below 10K. If it weren’t for this video, I’d be sitting in a law office somewhere right now. Its success convinced me to stick with the channel and look for freelance jobs rather than go back to full time employment. This month also featured my first tentative steps into crowd-funding, setting up my Patreon page, which allows supporters to chip in on a per video basis. This was a pretty pivotal month. Speaking from a year or so later, when Patreon and freelancing are combining to provide a decent for Istanbul lifestyle it’s interesting to look back to the beginnings. It took another five months before the Patreon page produced enough to even bother taking a payment. This month’s videos played with format, and they played with ideology. Any body of thought is going to have weird edges and contradictions to it, especially one that has existed over any length of time. This month’s first video makes a “modest proposal” to the US National Rifle Association, that it broaden its demographic by fighting drug prohibition. It’ll never happen, but the reasons why are worth thinking about. Next we questioned just how conservative Ted Cruz’s war mongering is. The month’s most successful video “How US Bombing Helps The Islamic State” pointed out just that. Next up was a “Bitter Island” a parody video, and an homage to the great Adam Curtis‘s Bitter Lake. We learned a valuable lesson here. I didn’t mark it clearly as parody, and some regular viewers were pretty confused(!). It was also fun to work collaboratively, which I need to do more of. Our last February video took a look at Tourism, and how important it is for economic development. As I mentioned above, views finally topped 10K again this month, going up to 10,055 from 5,385 the month before. Only one of the month’s top five videos was produced in February. The big story was the John Oliver video, which racked up 4,953 views all by its lonesome. Only one of the five new videos broke 100 views on the first day, but 15 months later all of them are at over 200 views, and three of them are over 600. As of the end of February we had 79 videos, all but one of which was viewed at least once, 57 of which were viewed over ten times, 12 of which over 100 times, and two of which over 1,000 times (FATCA and John Oliver). This was a tremendously heartening month. I decided that I would keep on trying to make it work as long as I could stay above 10,000 views a month. So far so good, 15 months later! So January was meant to be the month I gave up. I started looking around for work, and thought about wrapping things up on the channel. One theory about the all-powerful YouTube algorithm is that it likes frequency. The more often you post, the more likely YouTube is to put your stuff in front of people. One mentor in particular had been urging me to post more frequently all year. I had a bunch of scripts lying around so this month I decided to give it a shot. It went really, really well. I am not 100% sure that this theory is correct, but it’s worth mentioning that my most successful videos in 2015 have all come in or around weeks where I posted more than one video. I started off the month with a discussion of the US government’s disturbing announcement that it was responding to an alleged virtual attack from North Korea with very concrete sanctions. The next week I did five videos, an interesting experiment that I haven’t felt the need to repeat since. It almost killed me. On Monday we produced a somewhat grim meditation on that month’s Charlie Hebdo massacre and what it didn’t say about the “Clash of Civilizations”. On Tuesday we uploaded a faux-interview with one of my favorite punching bags, Rudy Giuliani, on his obsession with “Black on Black Crime”. I’ve done a lot of vids on this subject, finally working it into a format that people wanted to watch last May. On Wednesday we covered why Wall Street likes it when we talk about the 1%. Next up, on Thursday we exploded the idea of the “Islamic Reformation” in what remains one of my favorite videos ever. This may be a case for churn by itself. From 8 months later the first two vids this week look embarrassingly rough, but this one still works for me. The self-inflicted over-work may have thrown up a gem that wouldn’t have otherwise been produced. If Thursday’s video showed the benefits of churn, Friday’s showed it’s drawbacks. I’m visibly exhausted and half-assedly deliver what should have been one of the most devastating videos I’ve ever done, simply documenting how US government policy since 9/11 has made us much more insecure. Instead of being a block buster it remains one of my least watched videos ever. The five video experiment was very worth doing however. As I sat exhausted at Cafe La Viola, my hookah bar, the next Saturday, I quickly banged out a script on John Oliver. I am a big fan of the show, and the video is basically just an appreciation. “How Powerful Is John Oliver” was the second video I published the next week, after a celebration of progress on civil asset forfeiture. The Oliver video through some combination of the right title and an inoffensive message really took off. It became my second truly successful video after FATCA. 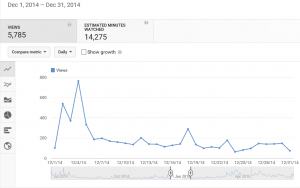 In January it only got 800 or so views, but even that level of viewership made it a success from the start. Whether it was algorithm voodoo, or just a result of good video-writing muscles, the 5 video week was apparently worth it. I closed out the very busy month with “Why I don’t Care About The Environment”, a video that is certainly not very popular, but I think answers a question that was worth covering. December is the worst. The Holiday season is a time for family, friends and good cheer! It’s not a time for watching videos about the state of the world. Unlike my likely disproved theory of the summer slump, I’ve got two years of empirical verification of the end of year crash in viewership. The graph of this month’s views is super depressing. A very strong start followed by a steady petering out. I did know to expect this, however. The same thing happened to my usually robust initial FATCA video in December of 2013, so it wasn’t too depressing to see it happen. It was a fun month of videos though, featuring collaboration, new approaches, and new subject matter. Though I didn’t know it at the time December began my longest period without flying anywhere since the 1990s. Budgetary constraints brought a forcible end to my globe trotting, but I think it was great for the channel. I have spent most of the past six months in a very small room, building my skills and thinking about ways to broaden my reach. There are many worse places to be marooned than Istanbul. December’s first video was produced in Connecticut at the tail end of my Thanksgiving trip home. Family friend and fellow Istanbul-ite Alev Scott (buy her book! ), and my super talented brother (admire his works!) were kind enough to contribute to this long delayed return to the topic of FATCA. This vid on FATCA’s effect on the United States rather than the rest of the world was well received, and gave me my first day over 700 views since July. Next up I did a video on Mary Shelley and how odd it is that she is still viewed as less important than her husband. This was my first foray into literary criticism. I really like how the vid came out, but it took an incredibly frustrating 5 months to crest 100 views. At the time I usually hit that mark in days or weeks, and now occasionally hit it in a number of hours. I want to do more in this vein, but I will have to think harder about how to make the vids easier to discover. I had long been toying with the idea of partnering with NGOs on videos, and this collaboration with The Sentencing Project, a criminal justice reform NGO, was my first effort. It’s also the last so far. As of this writing it is among the 8 of my 97 videos that have failed to crest 150 views. It may have been the curse of December, or the fact that it’s kind of a crap video (poorly lit, trying to accomplish too many things) but regardless I haven’t felt the need to repeat the experiment. Next up, improv buddy Andrew McCormick (Come See our Shows!) helped me produce a strongly libertarian take on what we should be learning from the Torture Report. My almost instant reaction to Obama’s announcement of a path towards regularization of relations with Cuba was the best viewed of my late December vids. I like to put more effort into my videos, but more timely reaction videos tend to open very well. Next up was a weird combination of a holiday thank you video and a sad reaction to Rudy Giuliani’s attempts to politicize the murders of two New York police officers. Finally I closed the year with a meditation on mass murder and how best to stop it. December was my most prolific month to that point. November was great. It’s an uncomfortable fact that current events outlets thrive on tragedy and my YouTube channel is no different. My series on the racist US criminal justice system really took off this month. I had been unable to produce it in time to take advantage of the summer’s Ferguson rage, but the grand jury’s decision not to indict Darren Wilson came down at the end of November, and gave me some of my biggest days since the FATCA video’s success trailed off in June. Though the performance of the channel didn’t come anywhere near the May and June heights, it was great to see something kind of work again. I only managed to produce 5 videos this month. Some issues with power in my Istanbul apartment derailed the production schedule, as did my trip home to the United States for the Thanksgiving holiday. Things generally went according to plan however. The “Our Racist System” series proceeded alternating more detail heavy videos with my own experiences as a white dude getting away with murder (not literally). First up was “Who Gets Arrested”, annoyingly the least watched of the series, which documents the differing jobs that police officers have in different jurisdictions. “Arrested While White:Privilege Edition” told my most outrageous story of white impunity, and was the biggest hit of the month. This may have been due to the use of the “White Privilege” keyword. The importance of the name of a video is a lesson I’m just beginning to incorporate six months later. “How The NYPD Proved That Justice is For Sale” is the closest thing to real reporting that I have ever done. It tells the disturbing story of what happened to the defendants in the high profile “Operation Ivy League” case from 2010 after the media stopped paying attention. “Arrested While White: Finally Arrested Edition” tells the tale of my weekend in jail in New Orleans, and the privileged treatment I received there. We rounded out the month with “Inequality and Incarceration”, which makes the little made but obvious point that we can’t deal with inequality without dealing with mass incarceration. This was the month I finally figured out Twitter. Since the beginning I had always been posting the vids on the service, but usually only once. I wasted time trying to come up with clever hashtags. Twitter is pitched as a micro-blogging service, but that’s not the point. It’s a direct communication service. You can contact anyone from celebrities to complete strangers who you think might be interested in your product. If you’re pitching something on twitter you need to do so with volume and directness. Last November I finally started doing this, and it represented a real turning point for the channel. If you’re uncharitable you could call my current use of twitter “Spammy”. If someone tweets on the topic covered by the vid, I reply with the video. It’s pretty straightforward, if annoying, and it gets the channel out there. In the past six months of doing this, through thousands of tweets, I’ve only gotten one complaint. The rewards can occasionally be out-sized, but the total yield probably averages about a view or less for each tweet. My channel is still small enough to make spammy tweeting valuable. At the end of the month I got one ridiculous piece of good luck. Around November 26th the #crimingwhilewhite hashtag became popular. In October and November I produced three “arrested while white” videos that were essentially built for this. An evening of frantic tweeting at my parents’ kitchen table gave me my biggest day of views since July. October was a weird month but a fun one. It brought the absolute lowest point in viewership following the channel’s initial expansion. The last month had made it clear that the fall in viewership wasn’t a summer thing, but a broader problem. This made for a grim September, moving from couch to couch in a still sweltering Istanbul. At the beginning of October, however, I moved into a new apartment of my own for the first time in three months, and my spirits rallied considerably. I was pretty sure I had failed and decided to just finish up what I wanted to do and enjoy the ride. The month’s first video gives a pretty good indication of my attitude at the time. Rather than weigh in on a weighty geopolitical matter, I decided to use my facial hair as a prop and address the possible phenomenon of “Peak Beard”. For the next one I got back to normal ground with a meditation on Douglas MacArthur and standing armies throughout history. It is poorly named, and therefore little watched, but I think it’s a gem, featuring Caligula, Derek Jacobi and Richard Rorty. Next up was a quick vid laying out the ridiculousness of a War on Terror that includes Saudi Arabia as an ally. The last four videos were the beginning of my long-planned series on criminal justice in the United States. I began planning this series at least a year prior. The channel was initially founded to address these issues, and I wanted to do it right. It felt great to finally get these out there. I’m currently planning my next intensive series, and the somewhat agonizing planning process feels very familiar. I ended up deciding to release two of these a week, with one vid addressing the issues more substantively, and another either telling a story or playing with the format. Three of the eventual ten videos told the stories of my own checkered past with the law in a series called “Arrested While White”. This month’s vids included an introduction, a tale of a high school non-arrest, a video pointing out the problems with trials and plea bargaining, and an attempt at an anti-cop PSA. September was the worst month of this project, emotionally speaking. Since Mid-June I had been consoling myself with the thought that the drop in views was due to the summer months. September, I was sure, would lead to a return to the exponential growth of March, April and May, and the possibility of actually making some money. Instead, the six videos I released in September remain, as of December, some of the least viewed on the channel. One in particular took a full three months to cross 100 views, which usually happens within a week. In addition, I got back to Istanbul and found myself homeless due to an exploding bathroom. The month spent on couches kept me from moving forward with a series on US criminal justice that I had been planning for months. But all of that was useful, because it helped me learn some valuable lessons. Turns out, YouTube isn’t all that into 5 minute plus confusingly “animated” videos on obscure topics like finance and legislative corruption from faceless droning voices. Since September I’ve only broken the 4 minute mark twice, and I stepped up my ability to produce on-camera videos. A depressing month, but I learned a lot about video-making and marketing, so it was worthwhile. The videos produced weren’t very successful, but I think they were pretty interesting. I started off with a five minute video comparing the performance and power of the UK and US financial industries. I think the role of federalism in the differences between Big Finance’s effects on the two countries during the Great Recession is worth further study, but it might not be the best subject for YouTube videos. Next up was the dismally performing comparison of the careers of New Orleans Mayor Ray Nagin and Congressman Eric Cantor. Disturbed by that video’s failure to go anywhere, I produced “5 Facts You Must Accept to Write About Foreign Policy in 2014“, a response to an article by the ridiculous Robert Kagan. I intend to do a lot more in this style, and on this topic in the coming year. Next I used Game of Thrones to attack another one of my great pet peeves, endless comparisons of 2014 to 1914. The next week I broke out the Elvis suit to point out the malign direction of US policy towards Iran and China. We rounded out the month with September’s only edition of Notes From the Golden Age, pointing out why “I Still Love the Arab Spring“. In terms of views, the bloodbath did finally halt in September. They were slightly up to 5,005 from 4,734 in August. This month also demonstrated the growing power of the back-list. Despite the dismal performance of the new videos, views were higher than August. 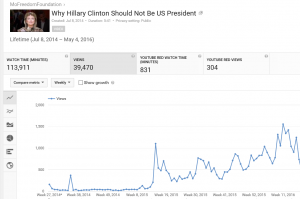 A website in the Czech Republic picked up the big FATCA video, and some right wing blogs picked up the Hillary Clinton video. Only one of the top five performing videos in September were produced in September. The video count keeps mounting. At the end of September we had 46 videos. All but one got at least one view that month, and 35 got more than ten. It provides a nice lower-bound for viewership as we go forward. September was a bit of a grim month, but I learned a lot. August featured video production in four countries, with differing degrees of success. The channel-wide slowdown due to falling interest in FATCA continued, but it was a fun month, and we got to experiment with some new topics and approaches. We kicked off the month by looking at Islam and the way it is portrayed in the US media. We looked beyond the idiocies of the Bill Mahers and the well meaning distortions of the Reza Aslans of this world to do a little comparative history. It turns out the evils of Islam are nothing compared to those of Christianity. I hope to do a longer video in this vein in the new year. Next we delivered another installment of Ask a Libertarian, which took a trip through Libertarian party candidates past and present. Next we produced the month’s break-out hit which asked “Who are We Really Fighting in Iraq?” As my country’s involvement in Iraq accelerated, folks seemed to enjoy a video that pointed out that conflict’s fundamental ridiculousness. After that, I headed to a wedding in the Socialist wonderland of Sweden. The video recording my thoughts was one of the most ridiculously produced in the channel’s history. Filmed in small northern Swedish cities and airports, edited in an all-night haze in a jumbo jet hostel in Stockholm, and uploaded from London’s Heathrow airport, I’m amazed it got done. The next week’s video didn’t get done. I was in Mexico for another wedding, and my laptop died. Luckily I had a cellphone camera, the Ice Bucket challenge, and a faux-Mariachi. The resulting video is fairly amusing. As I mentioned above, the post-FATCA viewership bloodbath continued. Monthly viewership almost halved from 8,617 in July, to 4,734 in August. At the time I consoled myself with the idea that it was a summer drop-off. 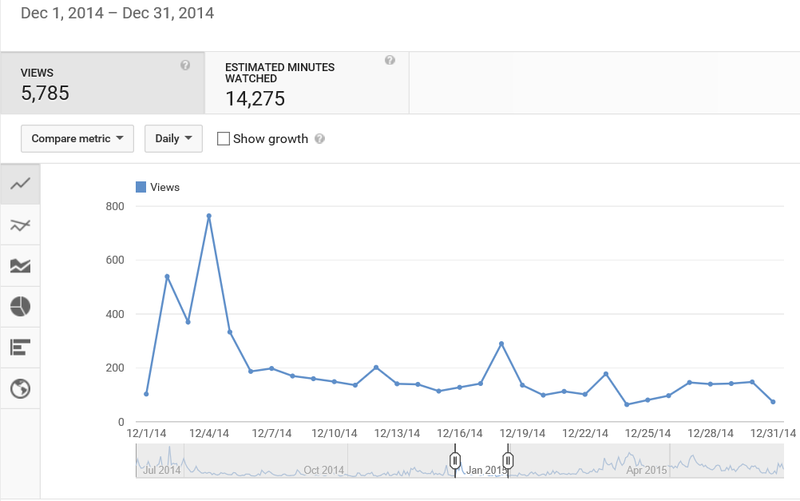 The month’s videos performed well considering the lack of a big video pointing views towards the channel.